By individually vacuum sealing poultry and other proteins for freezing you can prevent common food waste. Once individually packed, it can be thawed as needed. Meat is more resistant to freezer burn after being individually packed. It can even be cooked in the vacuum seal bag. The new Waring Commercial Vacuum Sealing System is an effective, efficient way for operators to vacuum seal food for storage and/or cooking in a smaller footprint. The WVS50 from Waring is a two-piece system that includes the pistol-style handheld vacuum sealer and a heavy-duty enclosed storage and charging base. With the sealer in the charger, the whole unit measures 8.25” x 5” x 8.25”. The handheld vacuum sealer runs on a rechargeable NiMH battery and is capable of sealing up to 50 bags on one full charge. 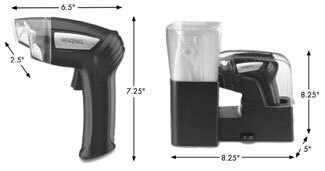 The Waring Commercial Vacuum Sealing System features direct power to the handheld sealer. This allows it to be used once it’s charged or while it’s plugged in and charging. The commercial system also has Waring’s quick charge feature. The charger base itself is fully enclosed, providing maximum protection from the elements of a commercial kitchen environment. Traditional vacuum sealing can be rough on delicate food products. The trigger operation on the pistol-style sealer allows for vacuuming more delicate, soft products with less risk of damaging them. The WVS50 comes with the vacuum sealer, the charger, 25 one-quart bags and 25 one-gallon bags. Additional bags are available in 1-quart, 1-gallon, and 2-gallon sizes. The bags are microwave safe and boil safe which makes them perfect for sous-vide cooking.